Pyrrhuloxias are permanent residents of Sabino Canyon. 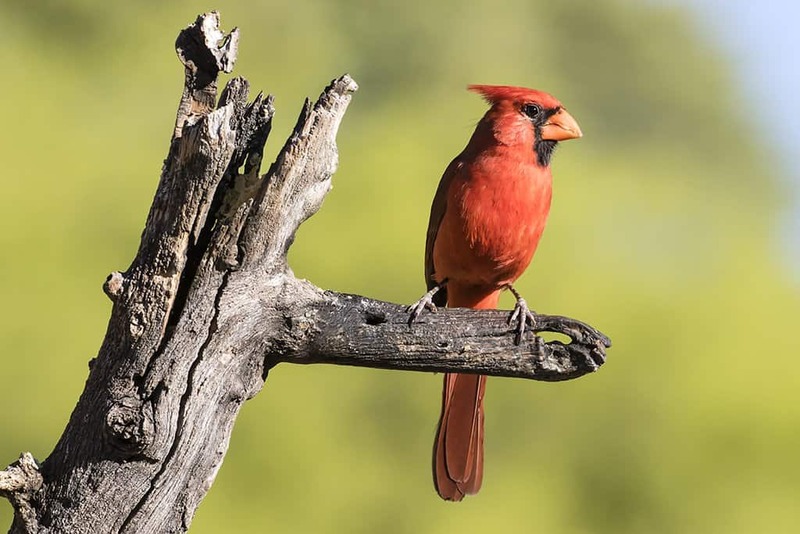 They are closely related to the Northern Cardinals that are also permanent residents here and their vocalizations are difficult to distinguish. During non breeding seasons they forage in mixed flocks hunting for seeds, large insects and fruits. When the saguaros are in bloom they will dip their head into the blossoms to feed on the nectar and pollen. In late February or early March the males become aggressive, establish territories and attract mates. 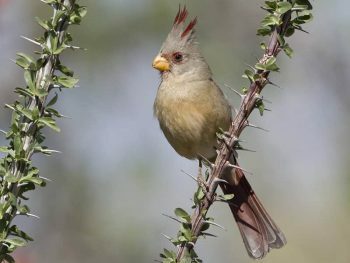 The male Pyrrhuloxia establishes and maintains a territory by patrolling the territory boundaries, singing from prominent perches and chasing away intruders. Territorial behavior continues until the end of the breeding season. If the first nesting attempt is unsuccessful, sometimes they will attempt nesting again during the monsoon season. 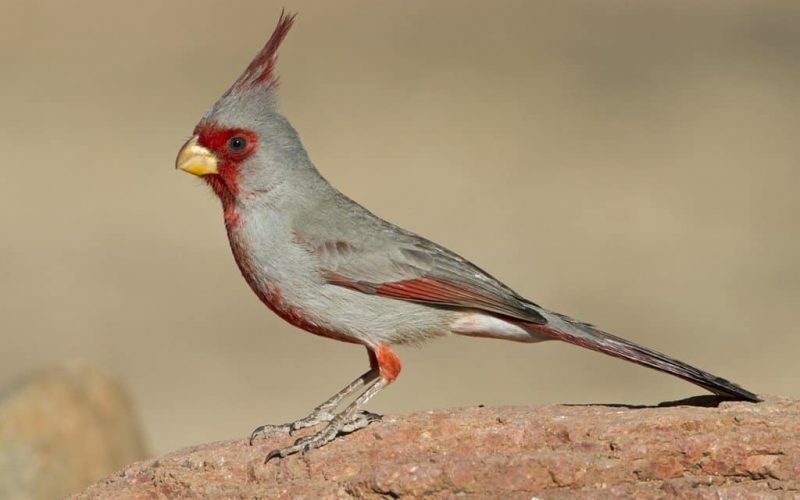 Both Pyrrhuloxias and Cardinals breed at Sabino, their territories may overlap, and no conflicts between the two species have been documented. The nest is constructed primarily by the female. Their nests are a small, neat compact cup constructed of thorny twigs, strips of bark and coarse grasses. They typically nest in mesquites or graythorn. Young Pyrrhuloxias leave the nest well before growth is complete, and the fledgling period can be as long as a month before the young are fully independent and join the feeding flocks. 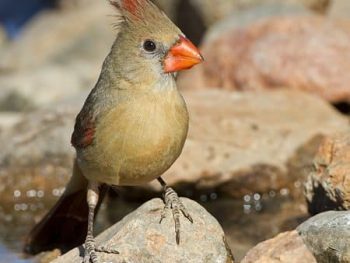 Visitors to the canyon frequently have trouble telling the difference between Pyrrhuloxias and Cardinals. 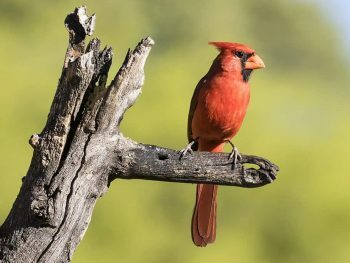 Cardinals have a conspicuous crest and a cone-shaped reddish orange bill. The bright red male Cardinal is unmistakable. 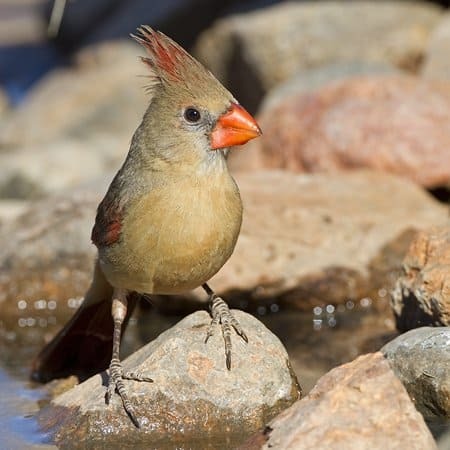 The female Cardinal is buffy brown tinged with a dull red on the wings, crest and tail. The Pyrrhuloxia bill is stubby, strongly curved and yellowish. I think of the bill shape as being like that of a parrot. They have a long pointed crest. The male is gray overall with rosy red on the face, crest, wings, tail and underparts. The female is pale brown colored, shows little or no red, with a thin spiky crest. I find that the bill shape and color is the easiest way to distinguish Pyrrhuloxias from Cardinals.